There is a delightful quaintness to Farahad Zama's debut novel titled The Marriage Bureau for Rich People and its sequel The Many Conditions of Love. The Marriage Bureau for Rich People revolves around Mr. Ali, a retired government clerk, who starts a marriage bureau in Vizag to keep himself busy. He is often taken into police custody for raising slogans against the government to protect the rights of poor farmers. His parents are worried about their only son and find it difficult to understand why he has to take to the streets to protest and get beaten up for the cause of farmers when they don't even have farmers in the family. It doesn't help matters when Rehman falls in love with a Hindu girl whom his parents disapprove of. This twist also takes you into the practical difficulties of a Hindu-Muslim marriage in India. You get the drift, don't you? The story gathers momentum when she finds a Brahmin girl called Aruna to work as an assistant to Mr.Ali - how the work flow is divded, the practical aspects of running a bureau are also detailed in a way that you would feel that you are a part of the family. The Marriage Bureau for Rich People delves into the kind of marriages that are arranged by families. Every family comes with its set of unique demands. There is a woman from a royal family that is known for good looking men and women with long noses, Her demand is that her son should marry a good looking woman with a long nose and she doesn't mind if the girl is not from a rich family. The book takes you through many more. 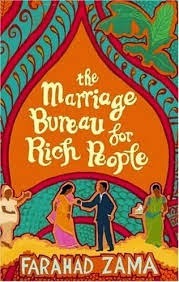 How Mr. Ali uses his intelligence and sense of humor to keep his marriage bureau flourishing is the icing on the cake. The book gives you an interesting insight into how Indian marriages are arranged, It goes into the 'behind-the-scenes' talks that happen between families even before a wedding is finalized, But the pace of the narrative seems to slacken at some places and rush at other points where it shouldn't. The sequel, The Many Conditions of Love, is more interesting than The Marriage Bureau for Rich People as the narrative is fresh, the dialogues are peppy and the characters are well-crafted. If you had to choose between the two, I would say read the sequel instead. There is a scene in the book where Aruna leaves her husband's home because she is insulted by her sister-in-law and her husband makes no attempt to speak for her. Aruna's family try to make her see sense and return to her husband's home but she refuses because she feels insulted by her husband's conduct. Finally, it is Mrs. Ali who tells her about the malicious gossip in the neighborhood and says, "This is bigger than your hurt feelings, Aruna. Your family's reputation is at stake. Whatever issues you have are not going to be resolved by running away from them. Go and fight for your rights. Solve your problems from within." "How long does it take for a broken heart to heal?" he asked. She replied, "The sadness will always be there. But your heart will mend and happiness can find a home in it sooner than you realize." That sums up our quest for happiness in life, doesn't it? Go for it, plunge in and read this interesting book if you can. I read this book some time back Swapa and really enjoyed it. You've done justice to the book with this review and reminded me of the unique characters and story line of the book. I had not realized there was a sequel and your suggestion here has encouraged me to pick up the second book. I think these stories help us analyze, challenge and examine our biases, prejudices and beliefs about love and marriage. Good to hear you enjoyed the book, Vishnu. The sequel is definitely one to read, so do read it. Like you said, these stories help us to examine our biases, prejudices and beliefs about love and marriage. Useful article for wedding and reception events this post is very helpful for the events people. Sounds like a lovely read! I liked the quote about the time it takes for a broken heart to heal.So true!! Dear Shilpa, It's a lovely book to read. Discovered that its a trilogy. The 3rd part in this series is called The Weddingwallah. I liked the first two books more though. Subhamastu is a growing kamma matrimony website, matrimony service exclusive for kamma's around the world. Search kamma brides, kamma grooms and kamma community matching profiles for your life partner here.